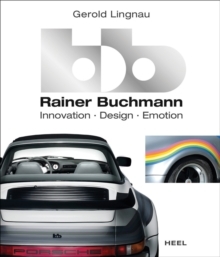 Car modifier b+b Auto, founded 1973 in Frankfurt by Rainer Buchmann and his brother Dieter, caused a stir in the 1980's European and international car scene by their technical innovations as well as their spectacular design. Initially focussed on Porsche cars b+b became established through their Porsche Turbo Targa with prismatic colours varnish presented at the Polaroid stand on Fotokina 1976 Cologne. At IAA Frankfurt 1979 they launched b+b CW 311, a contemporary modification of the legendary Mercedes 300 SL. Mercedes-Benz was so enthusiastic about the car that they allowed Buchmann to continue using the Mercedes star as a brand logo.During the 1980s, b+b was one of the most successful modifiers of production cars into individual luxury vehicles for those who could afford it - customers from the Arab world as well as celebrities from the Jet-Set...However Buchmann's real passion belonged to the area of electronic innovations, and the money he earned with his tuning activities was invested into research in this field.